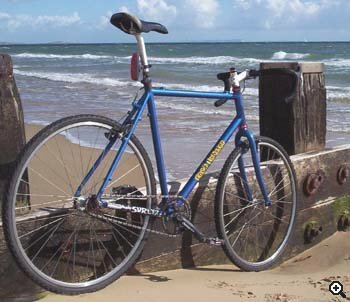 Until recently, my fixed/SS/hack/crosser was a 1980 Holdsworth Special called The Upsetter. Then this rebranded Kinesis Crosslite frame and forks came up on eBay for £127. I intended a quick frameswap at minimal cost, but got carried away. I ended up speccing what I wanted, not what I could justify to the wife! Built up, the Crosslite handles very well. It combines light weight with the stiffness necessary to cope with my 13 stone heft. However, the tolerances aren't perfect. I had to shim out the headset cups very slightly, one brake boss will lock down the canti if overtightened, and the alloy fork vibes under braking, squealing like a peacock or a mental patient. 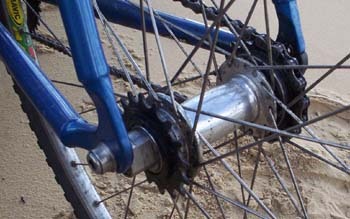 Plus it has vertical dropouts which, as we all know, are the work of the devil--less than ideal for single speed, and useless for fixed. I didn't let that stop me. After a day's hard selling on eBay, I splashed out on a flashy White Industries ENO hub. This ace bit of kit allows me to run S/S or fixed on a vertical drop out via its offset axle. Plus I can flip and flop to match my mental state. I like to freewheel to work in the mornings when I'm half asleep, then switch to fixed on the way home once I've woken up properly. I used Pinchy when I hid 60 bottles of brew in preparation for the Dorset Rough Riders MTB Club OrienBEERing champs. The narrow tyres and drop bars were perfect on the fireroads, and a keg of fun on the singletrack. He even coped with a two foot dropoff (I never saw it coming). Components are all pretty standard: Avid Shorty 6s, shimaNO cranks and levers, Real adjustable BB, Time pedals cos my knees are stuffed, Mavic MA3 rims, Blackspire Slalom chainring, White freewheel. One component I want to draw attention to is the Specialized Bar Phat tape, which comes with silicone inserts that sit under the tape. It's £5 more than regular bar tape but very good value. The combination of plush comfort with no loss of control is ideal for offroad drop bar users like us. All up, the bike weighs around 21.5 pounds. Why 'Pinchy The Angry Crustacean'? Well, the 'Angry Crustacean' bit is because it's a 'cross Rock Lobster. 'Pinchy' is what Homer Simpson called his pet lobster--the Simpsons generally stick to a useful "call it what it does" practice on pet naming (remember Stompy the Elephant?) I named Pinchy preemptively, since I suspect that those 35mm tyres will be seeing a lot of pinch flats. None yet, but I've notched up a few fractured ribs already. Charlie Hobbs organises the world orien-BEER-ing champs and The Clunker Classic. When not inventing new ways of making his mates world champions, he can be found fettling in his bicycle utility research lab (shed). Charlie did us a writeup of his defunct Upsetter. More on the ENO hub from the White Industries site.